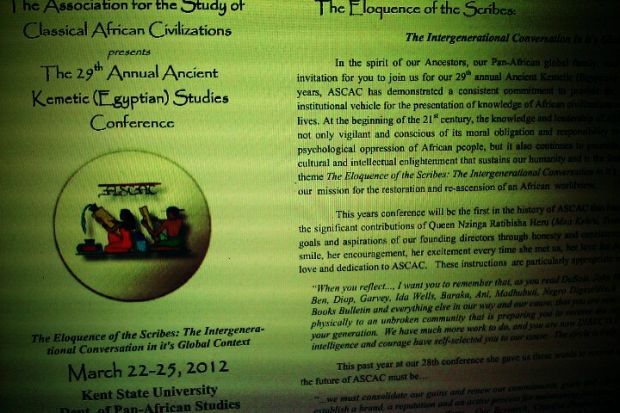 "Translation and Recovery: Intellectual Work and the Development of African 'Smart Power' In the Era of Africana Studies" + "Kemetic Womanhood"
Info: At the March 2011 conference of the Association for the Study of Classical African Civilizations held at Howard Unviersity, Dr. Greg Carr spoke on "Translation and Recovery: Intellectual Work and the Development of African 'Smart Power' In the Era of Africana Studies." ASCAC President Queen Nzinga Ratibisha Heru introduces him. Also included here is a panel discussion about Kemetic Womanhood where Dr. Valethia Watkins spoke on "Reconceptualizing the Gender of Africana Women," Yaa Ashantewaa Archer-Ngidi spoke on "Womancentricism – Restoring Ancient Principles" and Dr. W. Joye Hardiman presented "From Ancient Kemet to ASCAC: Sistas Holding up their Part of the Sky..."